One of Detroit’s finest producers is possibly one who also flies furthest under the radar. Blair French has been quietly releasing stellar music under his real name while also having his fingers in a number of other projects, most notably Cosmic Handshakes and Nois Land. His musical output ranges from purely cinematic works, to sun-kissed melodies to afro-house stompers and it’s this versatility that helps keep his releases 100% fresh. His latest is a solo EP coming out on Phat Phil Cooper’s NuNorthern Soul, which shortly follows a split record store day 7″ with Pontchartrain on Rocksteady Disco (hot tip!!). 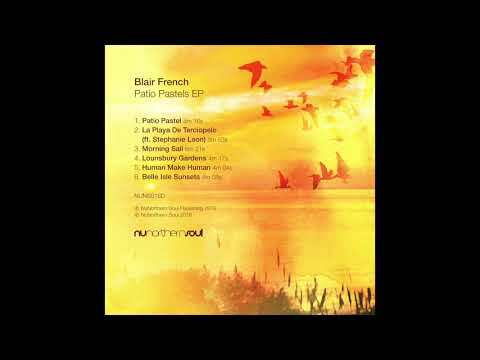 The “Patio Pastels EP” sees Blair don his balearic hat for six intoxicating tracks. Our premiere today is the title track. Let Blair French whisk you away to the tropics as you can almost feel the warm ocean breeze emanating off of the composition. The steady hand percussion and understated bassline create a repetitive and trance-like atmosphere that allows you to close your eyes, while the acoustic guitar (played by Michael Jurczak) and Blair’s melodies let your mind drift and wander in the sun and sand. Patio Pastel is constantly evolving, something we’ve noticed Blair do in the past on compositions such as Standing Still Is An Illusion, where the song turns into a journey in and of itself. Sunglasses on and mojitos in hand, sit back on your patio and relax as this is the perfect spring to summer transition album. Be sure to pre-order your copy directly from the label’s Bandcamp!